I’ve known Harlan Ellison for quite a few years - at first by correspondence and later by calling upon him at his fabulous abode, Ellison Wonderland, each time that I’ve visited Los Angeles. The most recent occasion was last year. As had not been the case on previous visits I had Susan with me. She’d heard all the stories about Harlan. She’d read his article in a Los Angeles weakly newspaper and seen his photograph in the same rag. She was convinced that she would hate his guts. She had to be dragged, kicking and screaming, to the Ellison mini-mansion. But Harlan turned on the charm. He just about charmed the pants off her. When we left he gave her a flower from his garden which is more than he’s ever done to me. As a matter of fact Harlan did much for me than just give me a flower. It was on the occasion of our first meeting, in 1976. Harlan regards one of my earlier novelettes, Frontier Of The Dark (ASTOUNDING, September, 1952), as a classic. He urged me to convert it into a novel. I said that I’d long since lost the carbons and the issue of the magazine in which it had been published. So Harlan told his Girl Friday to hunt in his magazine library for the ASTOUNDING in question, and then to Xerox the story. He then rang New York for Berkley/Putman. As a result of this I received a substantial advance before I as much as set pen to paper. they will come out the Odd Gods of the Galaxy alone know. And now we’ve had Ellison tour, Harlan down under, Having witnessed Harlan’s GoH performance I wonder why organisers of SF conventions ever ask anybody else to be GoH. At Syncon he did not go over like a lead balloon; he went over like the Hindenburg in her prime. He played to packed houses, with his audience hanging on every word. He did insult a few people - but there was justification. For example, when he was reading us a few of his newspaper articles somebody was taping it. Harlan stepped in mid-sentence and pointed out that the taping of copyright material is illegal. The culprit not only switched off his cassette recorder but left in a huff. I listened to Margaret Throsby interviewing Harlan on 2BL’S City Extra. She committed the sin, referring to science fiction as SciFi. Harlan smacked her down. A little later she asked Dr. Van Ikin (the Australian GOH) what his Christian name is. Harlan must have given her a dirty look because she apologised in some confusion and changed “Christian name” to “first name”. The next morning Harlan was interviewed on Channel 10 TV. The interviewer refrained (but it must have been with an effort) from referring to SF as SciFi but he did refer to Syncon as a Science Fiction Conference. He was firmly corrected. But it is quite amazing how many people, even people in the media - but they, of course, know less about more things than anybody else on God’s green Earth - still insist on referring to a convention as a conference. When I am involved in such controversies I always take as an example a Morticians’ Conference during which the delegates engage in sober discussions of all the dismal aspects of their macabre trade and a Morticians’ Convention, all booze and call-girls. But Harlan is most certainly a king of storytellers. Usually I stay away in droves when an author is reading from his own works. When I am asked myself to give a reading I invariably decline. At the Syncon Harlan did his usual convention trick, writing a story in public and then, on the last day of the con, reading it aloud. There was just one thing wrong with his performance at Syncon. He hadn’t quite finished the story. But he gave us a few clues so that we could, at least, establish the identity of the vampire. And as he read the story I felt a very real envy first for the marvellous off—beat idea that he so brilliantly exploited and then for the ability to tell the tale by way of the spoken word as well as on the printed page. Unlike many writers, including myself, Harlan is a workaholic. He carries his typewriter with him anywhere and everywhere he goes. And, working in strange locations, suffering from jet lag, he still turns out work of very high quality. He is a non-drinker (but he gets drunk on words). He is not a non-smoker. A man must have some redeeming vices. can see what we are so annoyed about. 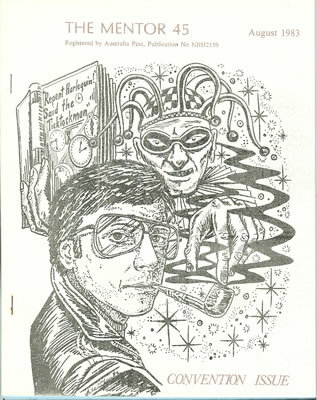 Harlan Ellison rang me in a fit of extremely bad temper to tell me about Dr. David Dale’s piece - THE NATIONAL TIMES, June 24 to 30 - on the 1983 Australian Science Fiction Convention. I therefore obtained a copy of the offending article. The next day, over lunch, Harlan and I discussed it. We both are strongly of the opinion that the record should be set right and that your attention be drawn to, among other matters, slovenly reportage. Harlan was annoyed by Mr. Dale’s unwarranted assumption that the science fiction community is divided into two warring camps - the Humanists (as typified by Harlan Ellison) and the Technocrats (as typified by myself). This is very far from being the case. For many years Harlan has been one of my Faithful Readers and for many years I have been one of his. Furthermore he has commissioned me to write the occasional short story for his justly famous anthologies. Whet annoyed me were the gross factual errors in the article insofar as I am concerned. To begin with, I was not one of the guests of honour at the Convention. I was just one of the attending members. And then there was this misstatement. “...A. Bertram Chandler, an Englishman now resident in Melbourne..,” I was, I admit, born in England (I had no choice in the matter) but I am an Australian citizen. And I do not live in Melbourne. In the next paragraph: “But A. Bertram Chandler proudly describes himself as a science fiction writer...” I do nothing of the kind. I admit to writing sea stories thinly disguised as science fiction. Then, a few paragraphs further on: “He started writing while he was working as a ship’s captain in the 1940s…” If I had held command in the British Merchant Navy in the 1940s I should, indeed, now be “older than God”. As it was I started the Second World War with the rank of Fourth Officer and has gotten as high as Second Officer by the conclusion of hostilities. It is true that eventually I held command - but by that time I was well established as a short story writer. The first part of the paragraph is quite correct. Chandler doesn’t have the charisma of Ellison. (But who does?) The second part of the paragraph is utterly erroneous. It was Harlan Ellison whom the fans flocked to see and listen to, not A. Bertram Chandler. We - I include myself among thee - got our full money’s worth. But as for a “War Of The Worlds Of Science Fiction”... What utter hogwash! Writers end readers, we are all members of one big international family and, as such, present a united front against condescending (from what spurious altitude?) and inexcusably ill-informed outsiders. Oh, we have different tastes. Some like Sword & Sorcery, some like Space Opera, some like hard-core, nuts-and-bolts Science Fiction, some like sociological Science Fiction. Many of us are willing to plough through something not-very-well-written as long as the ideas dealt with are interesting. Some, such as Harlan and myself, sill read anything - and that includes mainstream fiction - as long as the writing is good. And all of us regard science fiction (or science fantasy, or straight fantasy) as essentially a medium in which to kick ideas around to see if they yelp. I couldn’t write the kind of story that Harlan writes. He couldn’t write the kind of story that I write. But each of us, the Humanist and the alleged Technocrat, has his following. I am among his and he - there is no accounting for taste - is among mine.